Take a famous author working on a masterpiece, an unusual cat and mouse, an injured Tower raven, and the best cheese in the realm and throw them all into one inn. Misadventures abound. In 1858 London, alley cat Skilley is looking for a home when he hears The Cheshire Cheese Inn is looking for a mouser. He’s great at catching mice, but he doesn’t eat them. His real love is cheese. The inn has cheese in abundance, plus mice. So, Skilley and Pip, a very smart mouse, strike up a bargain. Pip and the other mice provide Skilley with cheese. Skilley catches Pip over and over and releases him. Charles Dickens, working on A Tale of Two Cities in a corner of the inn, notices all this activity. Meanwhile, the mice are also helping a raven they rescued from another alley cat, Pinch. Maldwyn, the raven, is missing from the Tower of London. Even the queen shows up in the end. Seems that everyone at the inn has secrets. Pip helps Dickens with the beginning to his novel. The cheese cook uses the mice as taste testers. The illustrations are realistic and beautiful and have the feel of the Victorian era. With a smattering of quaint language, the book promotes literacy skills. The reader also learns a lot about living in the era. 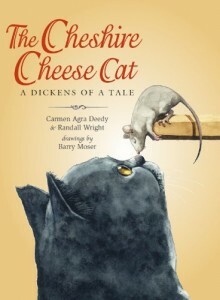 A great website is available at www.cheshirecheesecat.com with many reading activities. Take a kid genius inventor, add a couple of talking robots, throw in a pint-sized villain with a sidekick chimp, and you’ve got the ingredients for the first book of John Scieszka’s new six-book series. 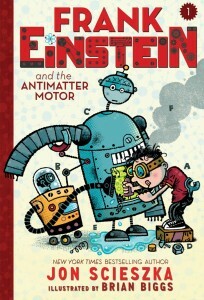 Frank Einstein loves to use household items to invent all kinds of things in his Grampa Al’s garage. He wants to build a SmartBot that can think and learn, but a power outage thwarts his efforts. Later that night, a bolt of lightning causes an electrical spark to bring not one, but two robots to life: Klink, the wisecracking brainiac, and Klank, the emotional hugger. Along with his trusted friend Watson, Frank enlists Klink and Klank to help him develop his greatest invention yet: an antimatter motor, which he knows is a shoo-in to win the upcoming Midville Science Fair. Winning this competition means a lot to Frank as he plans to use the prize money to help save Grampa Al’s repair shop. Disaster strikes when Frank’s invention ends up in the hands of his arch-nemesis, T. Edison, who not only uses the antimatter idea to win the science prize, but also kidnaps Klink and Klank. Frank must use scientific knowledge and logic to save his robots, overcome the enemy, and save the world from destruction. All in a day’s work for this super genius hero! 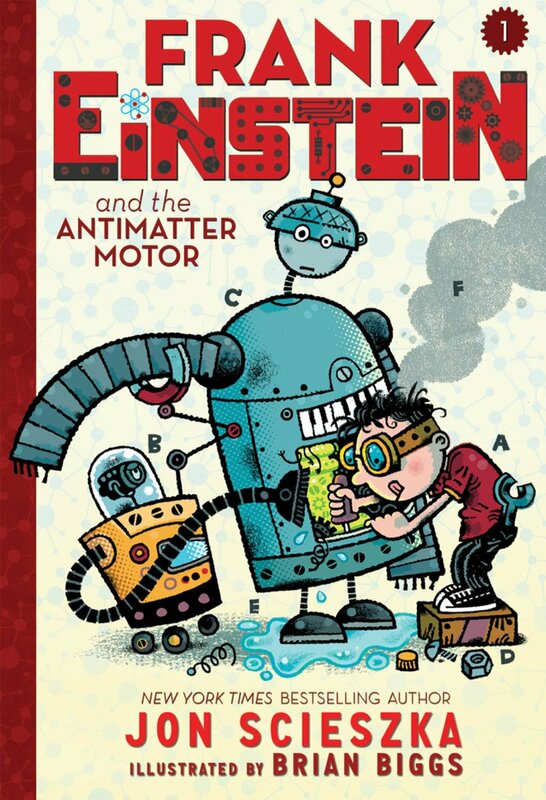 Scieszka continues his mission to bolster the reading habits of children, especially reluctant boy readers, by adding a healthy helping of silliness to the real principles of science: observation, hypothesis, results, and conclusion. Facts and figures are presented at a fourth grade level with help from Biggs, who creates easy diagrams and illustrations in a cartooning style. Fun to read and good for you, too. A winning combination. 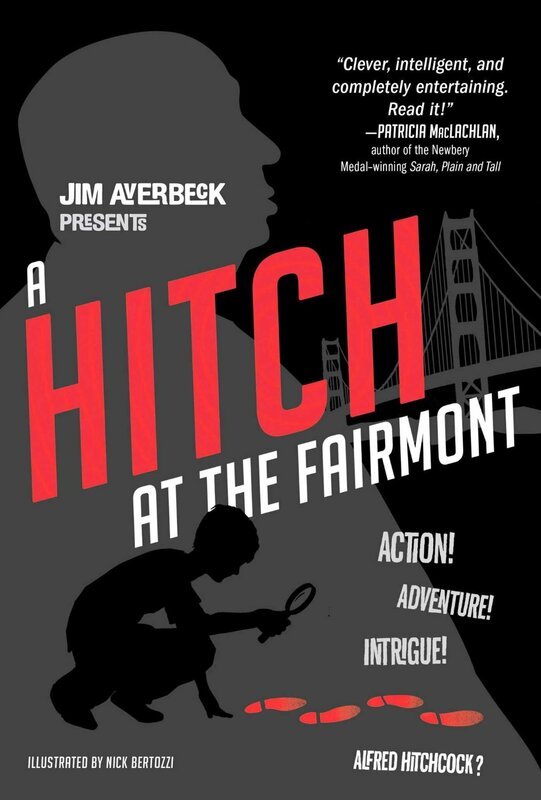 Combining a lot of conjecture with a lot of historical accuracy, author Jim Averbeck takes the reader on a romp around San Francisco of the 1950’s. 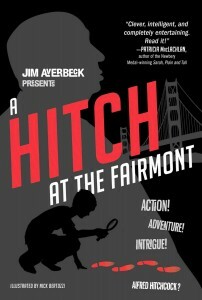 When eleven-year-old Jack Fair is orphaned, he moves to the Fairmont Hotel with his Aunt Edith. Shortly after Jack encounters Alfred Hitchcock, in town to check out filming locations, his aunt disappears. The last thing Jack wants is for the police to get involved. He knows his life is better outside the system, even with a mean aunt. So he enlists Mr. Hitchcock’s help to find his aunt. Communication with the kidnappers takes place with carefully arranged chocolates, on laundry lists, and by words circled on a newspaper article. The search leads them to an old mission, to Chinatown, and to the docks. We get to see Hitch as a beatnik poet and as an Aunt Edith facsimile. Averbeck follows the smoking gun rule carefully, where anything mentioned more than a couple of times has more significance to the story than suspected at first. Each chapter is tied to and titled after one of Hitchcock’s films. And each chapter begins with a short graphic depiction of what happens in that chapter, helping to increase comprehension. Readers will learn about film history, as well as about the books that inspired many of Hitch’s films. They will also learn about the history of San Francisco and some of its most famous landmarks.